She ran up to me during reading centers and yelled, "HERE! PUT THIS RING ON! I made is just for you.......am I being good now???" (She has such a way with words). I was speechless. 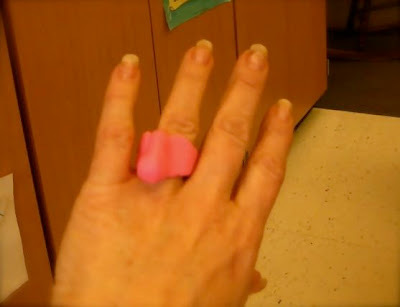 And while I eventually returned it and told her to put it back with the rest of the PlayDoh during clean-up time, I have to say that it was the most maginificant proposal ever. Not very expensive, but still priceless in a way. Cute! Sasha wants to do well for you, just her "full-of-lifeness" gets in the way sometimes. She is one who will come back to you when she is grown to let you know what an influence you had on her life. How sweet! Probably the most memorable proposal ever. Playdoh is a girl's best friend. Yes. Teach them to bribe you with jewelry when they're young. I'm so on board with that. Hard to tell what changes in their minds from getting into mischief to following the rules. I think most would agree,the making up after the mischief can make it all worthwhile. There are times when one could say that Playdough rings or at least the thought that went with them, are as precious as the real things. Still keeps the phone completely sealed on the seams with a membrane technology. It doesn’t look very pretty, but this iPhone 6 Plus case will keep your investment safe.